What's your best fresh-squeezed lemonade tasting lemonade (that doesn't involve squeezing tons of fresh lemons)? I love fresh lemonade. Crystal Light is a poor substitute. But, I hate squeezing an entire bag of lemons just for one pitcher, especially since it’s just my hands and a really basic juicer. So, what’s a good in-the-middle recipe? I’m a fan of Newman’s Own. 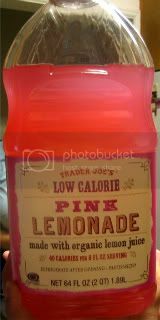 Trader Joe’s has a relatively new, lo-calorie pink lemonade that is just about the best lemonade I’ve ever tasted. If you pour it into glasses or a punch bowl, you can thinly slice some actual lemons to float on the top to make it really festive, or you can stick a paper umbrella with a maraschino cherry in it. Whole Foods fresh squeezed lemonade. @Kardamom :( We don’t have a Trader Joes. @creative1 I’ve been there, when I would visit my Grandma in CA. I love it. We just don’t have one. Which is weird, because CO is basically where all the Californians move when they want to be able to afford both a house and a child. But I think it may have something to do with liquor licensing here. @MyNewtBoobs Don’t give up hope we just got our first one in Warwick RI last year. Before this I used to go to MA to shop there which isn’t bad for me since there is one by my sister. @creative1 It’s a four hour drive to the nearest border. @Blueroses So then how the hell does it take us 4 hours to reach WY? it’s only 100 miles, are you driving a covered wagon? I’m baffled. It must be some dark magic then, slowing you down.